ANY CHURCH OF GOD members recognize the name J.W. Buckalew as a gambling drunk who became one of our greatest evangelists. Raised among strict Baptists highly opposed to speaking in tongues, becoming Pentecostal did not come easy for him. Around 1898, while working in a cotton mill in Cordova, Alabama, he met Leonard P. Adams — an attorney who had given up his law career to preach the Gospel. On a Cordova street corner on a Monday morning, Buckalew saw this tall, black-eyed man coming toward him. The Memphis, Tennessee, preacher reached out his hand and invited Buckalew to tent revival. With tears dripping down his cheeks, Adams told Buckalew he loved him and was praying for him. Although he reluctantly agreed to attend the Saturday night service, when Adams started speaking, Buckalew confided in Mattie that he had never heard such preaching. When the altar call began, Buckalew ran out of the tent into the woods and lay down on the ground in an attempt to quash the conviction he felt. Hearing a voice saying, “Now or never,” he ran back under the tent, fell in the altar, and confessed his sins. Mattie met him there, and together they prayed through. Buckalew was so impressed with Adams that he went back for the Sunday services, where he heard the doctrine of sanctification preached. After his sanctification experience, Buckalew began preaching. By 1904, he was reaching up to 1,000 under a tent. Scores were being saved. Hearing a voice saying, “Now or never,” he ran back under the tent, fell in the altar, and confessed his sins. In 1907, people started showing up at Buckalew’s services speaking in other tongues. Buckalew was convinced that he had been filled with the Holy Ghost when he was sanctified, and he did not believe in the doctrine of tongues. When he asked Adams for an opinion, Adams took him through Acts 2 and asked if Buckalew spoke in tongues when he was sanctified. Replying “No,” Buckalew left the meeting. He later said that, for the first time, his tent was full but he was empty—meaning the anointing to preach was gone from him. For a short time, he tried to sell books and Bibles, but God was not done with him yet. In 1909, Buckalew heard from a Brother McCleskey, who was having a Pentecostal revival in his home in Boaz, Alabama. The preacher, Sister Clyde Cotton, was a Spirit-filled, tongues-speaking woman. Perhaps out of curiosity, Buckalew attended the meeting, where he fell out in the Spirit and spoke in tongues. For four and a half hours, he was unable to speak English nor get up from the floor. Afterward, his tent was full, he was full, and his crowds grew to as many as 2,000. 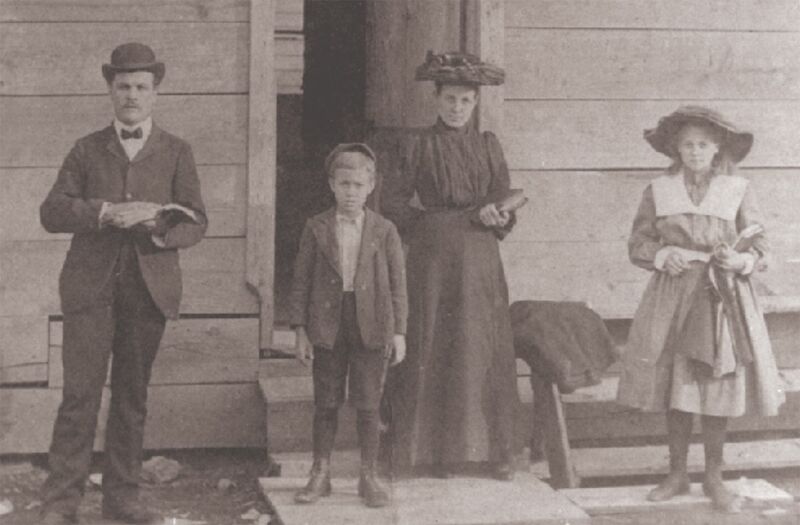 By 1910, Buckalew had become an ordained minister in the Church of God. He died January 24, 1918, at only 47 years old. He and Mattie are buried side by side in Trion, Georgia.